Reel Gems Pictures has created Rhonda Investments LLC (the "Company") a limited liability company established in Los Angeles California. Investors who participate in this film project will share in the profits of the entire distribution chain, and not just the domestic returns provided by most Hollywood arrangements. Our goal is to create a mainstream film with a proprietary character set of dynamic and lovable 3D animation puppets and 2D cartoon figures (flats) along with their adversarial digital counterparts, that cater to all ages and can be exploited through a myriad of products in multi-platformed merchandising programs. We have a team of executives with varied and wide expertise. The Company's managers are recognized in their fields as highly accomplished in both filmmaking and product exploitation through mass-market distribution. The Company has also formed relationships with key consultants and advisors, who will be available for important roles. This collective expertise will provide all the necessary ingredients for success, including domestic distribution, foreign distribution, pre-production, stop-motion and digital production, visual effects, post-production, legal, directing, sound and without exception every aspect of the motion picture business. Rhonda is a modern thriller that puts at odds old school filmmaking technologies with the new digital age. Trying to survive, aging animation puppets of yesteryear's movies are no longer in demand, now relegated to making personal appearances at sparsely attended signing shows, making a few dollars here and there for personalized autographed photos. Some have even sold their likenesses to the new, up and coming, digital production company, Demon Digital. However, Demon Digital, in its zeal to corner the market, is aggressively purchasing likeness rights of the willing and aging puppets, but for unwilling subjects, they have turned to kidnapping, torture, and murder. Rhonda, a successful detective, and a famous animation puppet who has since left the business, has been called by her fellow ball and socket actors to find out what has happened to their missing friends. The Rhonda project will be shot in 3-D, greatly enhancing the extensive visuals and motion dynamics of the characters and action, captivating and heightening the viewer experience. Rhonda, with a prospective G or PG-Rating, offers a fresh cavalcade of animation characters, designed for all ages, where Spin-Offs, Direct Product Merchandising, and Brand Licensing are all viable channels of exploitation. Since 2002, the U.S. motion picture industry has successivley realized, year after year, box-office increases, with its best years in the last 30 years according to the Motion Picture Association of America. With the highest level of ticket sales since 1957, overall business grew to 1.64 billion tickets in 2004 and has been on the rise ever since. 2013 box office revenues are expected to surpass current trends, even with other entertainment options such as the internet, cable, pay per view and dvds. However, the large corporate paradigm has fallen short, opening the market for creative independent filmmaking, where stop-motion features have performed well at the box-office (Chicken Run-2000: $225MM, The Polar Express-2004: $307MM, Coraline-2009: $125MM, ParaNorman-Aug2012: $90MM) with additional revenue in DVD rentals, cable TV and other ancillary markets (detailed below). Throughout the world, cartoon and animation characters have endeared us for generations. In recent times, no one has developed and capitalized on a cavalcade of characters like in the days of old, when Disney, Warner, and all the other major studios were in the business providing a host of characters. Rhonda provides a new breed of characters that cater to all ages. Although there is always risk attributed with any venture, this plan significantly reduces the risk, and poses a viable path to greater and greater proceeds, which will translate into profits. A motion picture's commercial appeal is undoubtedly the single most significant factor in determining its financial success. This is closely followed in importance by the agreement that a production company has with its film distributors. All of these factors affect the bottom line. With the public starving for more action packed suspenseful stop-motion films and the implementation of our multi-level merchandising of our proprietary character cavalcade, investor's risks are minimized while maximizing the potential for exceptional profits. This marketing approach will create a huge demand and a loyal customer base for the product line. The gross revenues to be generated by the film include the proceeds from the sale, licensing, distribution and exhibition in the United States and foreign theatrical, home video, television, satellite, cable and other ancillary markets. Reel Gems Pictures has created Rhonda Investments, LLC (the "Company"), a limited liability company established in Los Angeles California. The Company will offer a secure and lucrative opportunity for financial partners. In addition, investors who participate in this film project will share in the profits of the whole distribution chain, and not just the domestic returns provided by most Hollywood arrangements. Our goal is to take new and fresh intellectual properties that entertain and shape social thinking with positive messages and turn them into mass merchandising entities like the Star Wars project. The Company plans to take the Rhonda model(s) beyond just a theatrical release and dvd distribution. Through mass merchandising our product lines, the word Rhonda will be transformed into new animation character trademarks for a generation that has been left wanting. By using this strategy, every advertisement dollar spent on the Rhonda project would simultaneously cross promote everything in the product line. This would lead to lower advertising cost, higher market penetration and higher profits. The principals of the Company bring to the development of this project a proven track record of successful professional experience as well as in-depth expertise in their respective fields, while reaching out to key consultants and advisors, who will be on board for this project. Gene, known throughout the industry for his creative excellence and professionalism is presently involved as creator/producer of the stop-motion thriller, Rhonda, in development as a feature film. With over three decades of creative developmental experience, Gene's, innate talent to view projects holistically, his penchant for detail, his collaborating spirit and ability to meld a cohesive team, contributes to the ease and seamless nature of every project he has worked on. Gene has been a recipient of both the Academy Award� and the Emmy Award�. 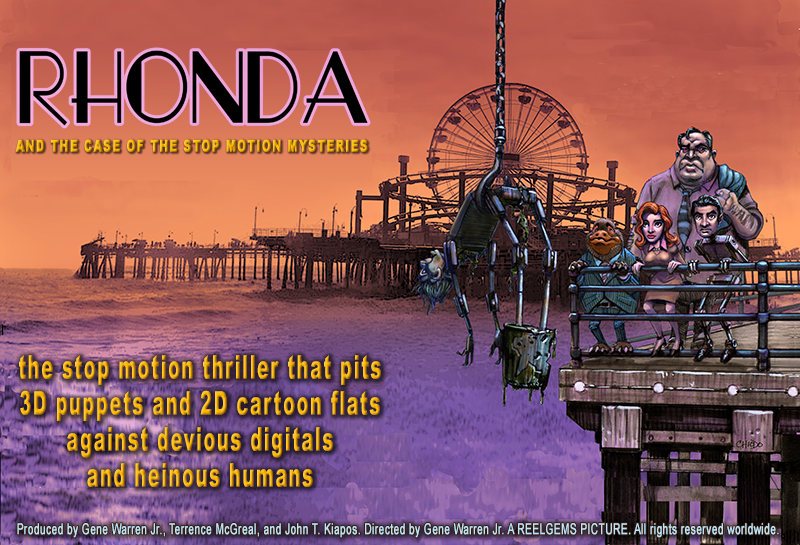 John, with Gene, has also overseen the development phase of this stop-motion animation thriller, Rhonda. From script development and consultation, through budget, business plan, and marketing. John, who also has a long and successful history in retail product development and mass-market distribution, was the recipient of the Telly Award� (2007) and is currently Executive Producer of "Gentlemen Callers", a TV-Sitcom pilot for network television (2012). Terrence, from Quantum Braintrust Production, has joined Gene and John in the developmental collaboration of Rhonda. Terrence, an independent filmmaker, brings to the mix a host of talents including pre-production, animation, and post-production skills. Terrence was the recipient of the Telly Award� in 2007. Since 1982, Charles, Edward, and Stephen Chiodo have garnered an outstanding reputation as innovative and cutting-edge producers who create and bring to life the most amazing characters in the stop-motion genre. Besides having created the cult classic, Killer Clowns from Outer Space, they are world renown for their expertise in stop-motion, live puppetry, make-up effects, costumes, and animatronics. The Chiodo Brothers will bring Rhonda to life with the best and the brightest in exacting detail and subtleties of nuance. Tim and the Area 51 FX team are Emmy Award� winning artists specializing in the creation and production of original imagery in the digital genre. Tim is regarded as a prominent expert in 3D animation, matte painting, character animation, and visual effects design and supervision. Some of Tim's credits include Dune, X-Files, and Blade Runner. Rhonda's digital adversaries could not be in better hands. An investment in RI, LLC offers aggressive balance to an investment portfolio. Reel Gems Pictures, dedicated to the development of mainstream entertainment for all ages, has great investment opportunities and is looking for investors and companies that will seize the opportunity to participate in the Rhonda stop-motion animation feature film project. �Copyright 2010 - 2019, REEL GEMS PICTURES. All rights reserved worldwide. Rhonda is a trademark of Reel Gems Pictures. Artwork provided by Charles Chiodo. Web Design and Hosting by JoKiCo.